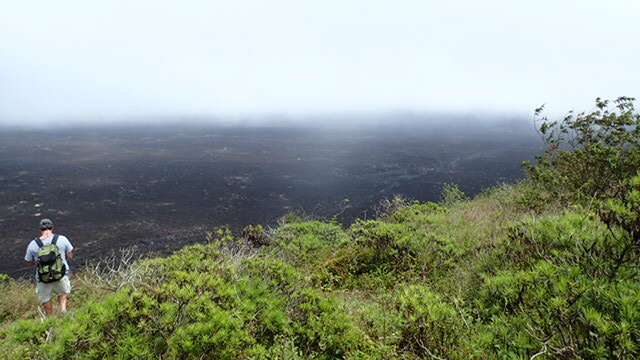 The next day wasn’t much easier – a ten mile round trip hike to the rim of Sierra Negra, the second largest active caldera in the world, five miles across at its widest point. The day didn’t start out well. In the rush to pack everything we would need for the hike — including moleskin, which as you will soon see came in very handy – I forgot my camera. Therefore, all photos in this blog entry were taken by Chet King, one of the other participants on this trip. 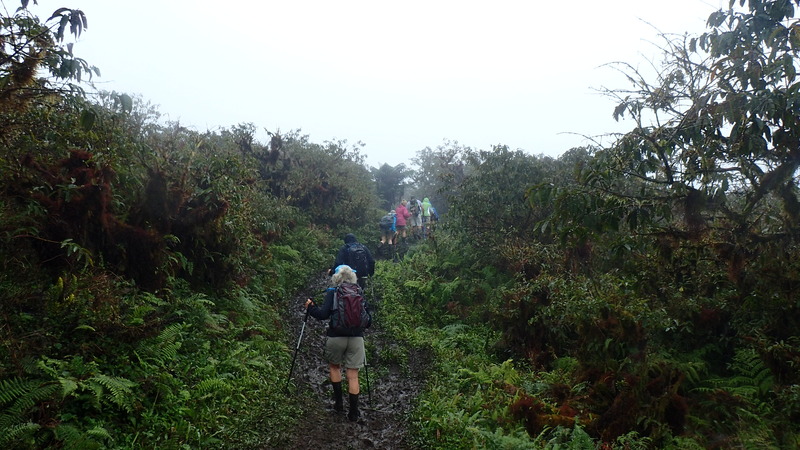 The first part of the trail is almost all mud, so we wore rubber boots to work our way up the muddy trail. After only a few hundred yards, we had to stop to fish Katherine’s socks out of her boots and replace them with more substantial hiking socks. This was a harbinger of things to come. By the time we reached the rim and changed back into our hiking boots, Katherine had a huge blister. 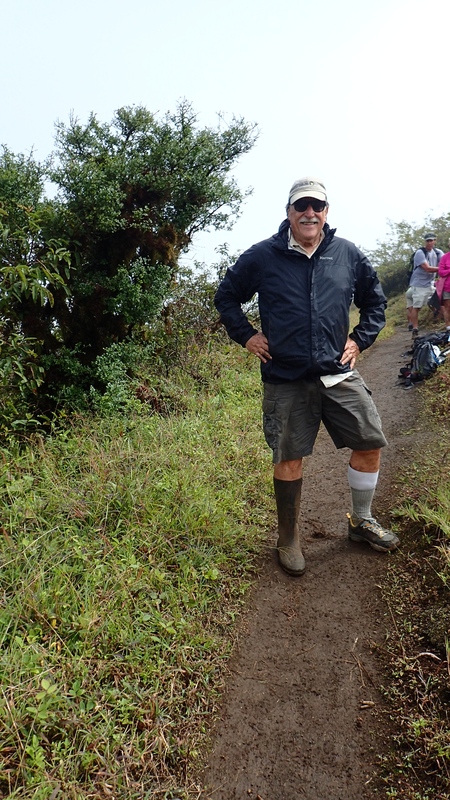 That moleskin came in handy, as did the duct tape that Terry, Chet’s wife, had also brought along on the hike. It did the trick, sort of, though it did slow Katherine down, forcing us to turn around at the four mile mark and head back early to the trail head. By the way, the reason I am wearing a rubber boot on one foot and a hiking boot on the other is that Katherine discovered her blister as I was changing into my hiking boots. Being the thoughtful husband that I am, always looking after my wife’s welfare (is that snickering I hear? ), I immediately dropped what I was doing (stop that snickering!!) and rushed to her aid. Ergo the mismatched footwear. As they say in LA, it’s a look. In any case, it was a great hike despite the blister problem. That is until we got back to the mud and slipped and slid our way down the last mile of the trail. The next day started with a very rough boat 2.5 hour boat ride to the island of Santa Cruz for our last full day of the trip. I didn’t get seasick on the 2 day crossing of the Drake Passage to Antarctica in 2012, the 3 hour boat ride to St. Kilda off the coast of the Outer Hebrides in 2007, or the four day adventure travel conference on a boat off the Norwegian Coast during the first North Atlantic storm of the 2008 season. But I came awfully close on this one. If that trip had lasted 20 minutes longer I’m sure I would have lost “it” (I’m too polite to specify the “it” I would have lost, but I’m sure you get the picture). 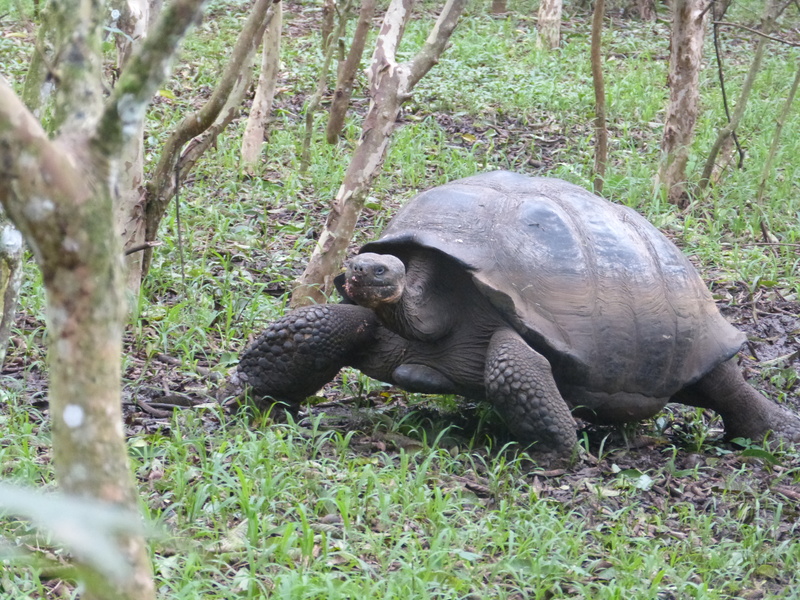 The seas were so rough we had to skip our last kayak trip and spend the day visiting the Charles Darwin Research Center, then El Chato, the natural habitat of the largest species of tortoise in the Galapagos. We walked through the reserve for over an hour for up close, often eye-to-eye sightings of these fantastic animals. 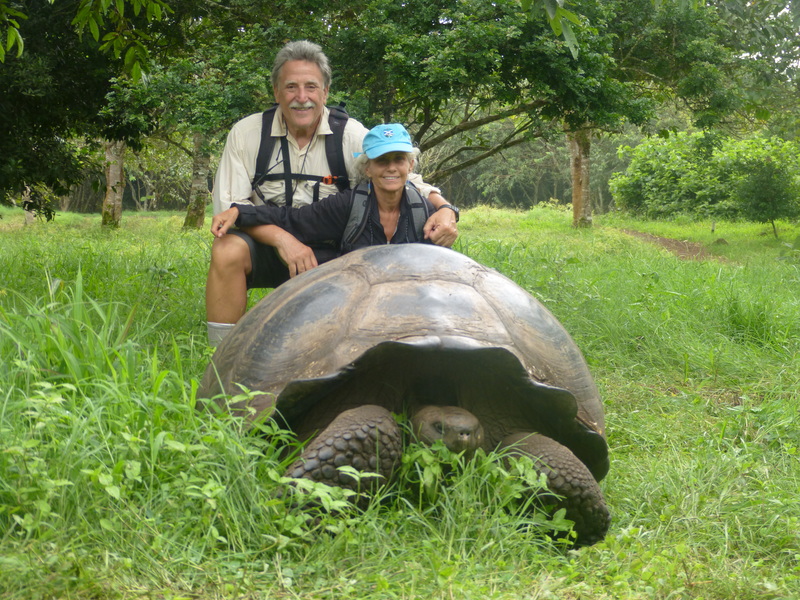 I feel a special affinity for the Galapagos tortoise. Like me they are large, slow and ungainly. 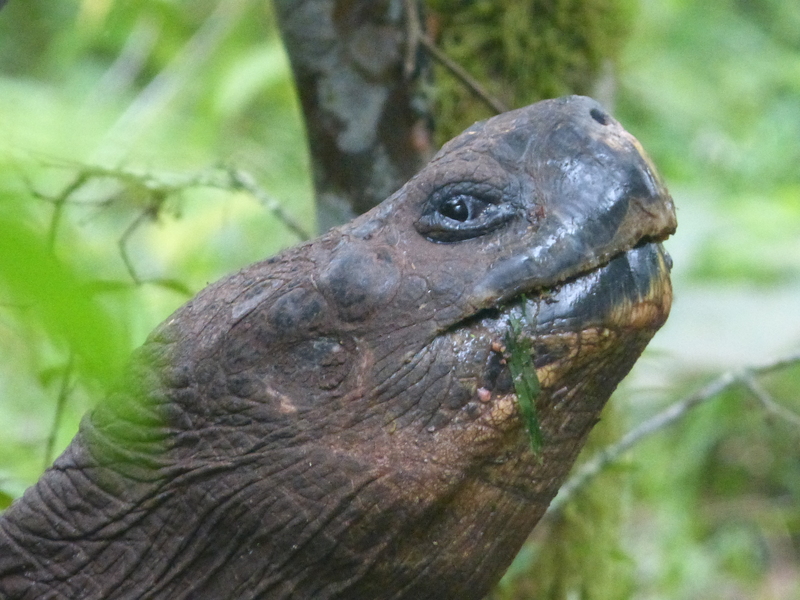 I take some consolation in knowing that they also live a very long time, well over 100 years on the average. Maybe that’s the trade-off –- move slow, live long. I can only hope. 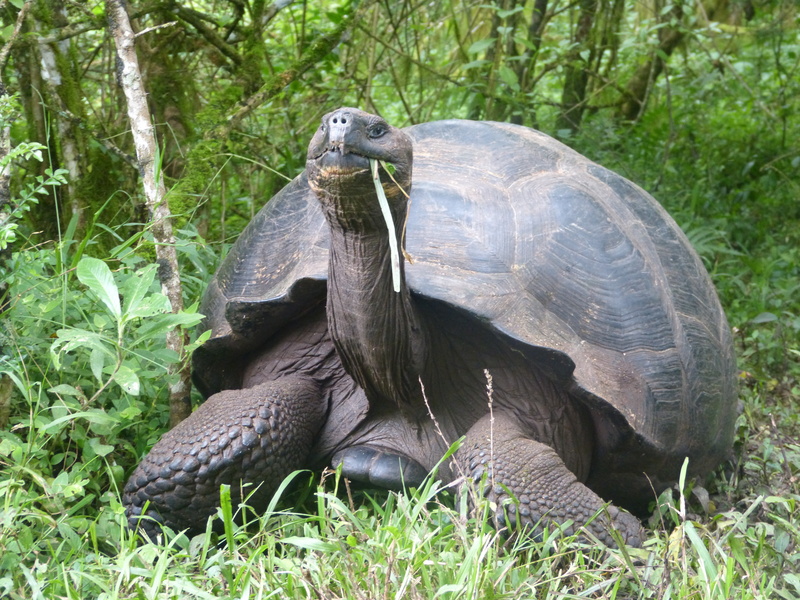 This entry was posted in Galapagos, Galapagos, South America, Travel by admin. Bookmark the permalink.